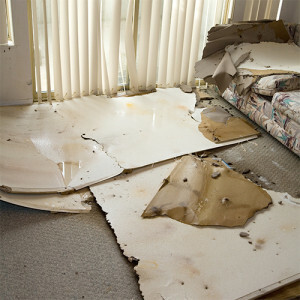 When water damage happens, minimize your stress by choosing a trusted, locally owned, water damage restoration company. How will King’s Quality restore your property? One of the key components of restoring a building that’s been ravaged by water is conducting a thorough inspection of the property. This requires the right resources to identify all of the areas where moisture is trapped, specifically those that can’t be seen, or felt as being “wet”. Our highly trained water damage restoration technicians will employ a specific combination of moisture detection equipment, including penetrating and non-penetrating moisture meters to accomplish this task. By identifying all of the saturated areas, we can dry them immediately, and eliminate the conditions for mold to develop and for structural damage to occur. The next step is to remove all of the standing water in the building. Our technicians will extract the water using our powerful extraction machines. For multiple story buildings, we use portable extraction machines that rapidly remove the water and are easily mobilized from floor to floor. In order to dry your property quickly, our technicians place high velocity commercial airmovers to evaporate the moisture from the building. This specialized drying equipment is complimented with powerful dehumidification equipment in order to decrease the humidity in the building and accelerate the drying process. Once the equipment is strategically placed for optimal drying, our technicians monitor the drying process daily by taking moisture readings at each affected area and drying those areas in compliance with IICRC S500 Standard & Reference Guide for Professional Water Damage Restoration. As our client, you will receive detailed documentation of the work performed at your property. This is to include digital photos, moisture readings, closure testing results, and a complete summary of methodologies used, to prove the fix was successful. Full-service fire, wind and water restoration experts.